You may recall we recently featured the Dunlop shoulder bag recently, commenting that its traditional looks had come full circle – making it quite a cool retro find. 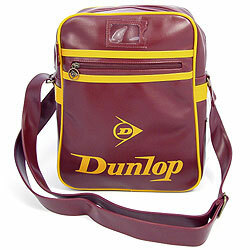 Now we’ve seen something slighter better – the Dunlop retro flight bag. In terms of styling, it’s not much diffferent, with the traditional Dunlop logo again displayed on the body and with the same burgundy and yellow colour scheme. However, this one has that traditional (and more fashionable) flight bag shape, along with a long adjustable shoulder strap, interior zipped compartment, exterior zipped pocket, plus a small transparent label window. Available now – and priced around £19. so where can you buy the bag from?